Home › AIR GUNS › AIR RIFLES › AIR RIFLES SAM YANG › Air rifle Big Bore 909 9 mm. 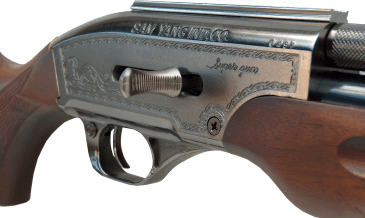 Air rifle Big Bore 909 9 mm. Muzzle velocity - 200 m / sec. Overall Length - 1070 mm. Barrel length - 550 mm. Big Bore 909 9 mm. is one of the most powerful air rifles in the world. With an attractive appearance in hunting style and very good craftsmanship. Big Bore Air Rifle 909 9 mm. 16 powerful shots with a single tank.